Note that an up-to-date list of GSN seminars and neuroscience related activites maybe found in the Munich Neuroscience Calendar! After almost 10 years, the MCN Monday Lecture Series developped into the Munich Neuroscience Lecture Series. The newly established event is meant to expose students and faculty of the greater Munich area to key figures across fields in neurosciences and, ideally, inspire a broad audience of scholars. The monthly seminar will be a special event attracting researchers and students with a wide range of interests. During each term, the seminars are scheduled on every first available Monday of the month, at 6:00 pm and will be held at the LMU Biocenter. 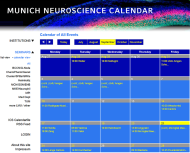 Details about the individual talks can also be found on the Munich Neuroscience Calendar. Listing of current workshops, seminars and colloquia in the LMU Neurophilosophy and Ethics of Neurosciences Research Center. The Friday Neuro-Lunch Lecture Series features local researchers presenting their work. Lectures take place weekly in the BioCenter (GSN Kursraum, D00.003) and are open to all GSN affilates. Upon invitation by the Bavarian State Ministry of Science, Research and the Arts, the Munich Center for Neurosciences - Brain & Mind coorganized the Munich Christmas Lecture Series, held at the Residenz in Munich. The Christmas Lecture Series was inspired by the traditional Christmas Lecture of the British Royal Institution. The first lecture was held on December 19th, 2011 by Wolfgang Klein from the Max Planck Institute for Psycholinguistics in Nijmegen (Netherlands) on beauty and aesthetics. "Der Mensch und sein Gehirn"
During the 2010/11 academic year, a university wide, interdisciplinary series of 15 lectures titled “Der Mensch und sein Gehirn” (Man and his Brain) was co-organized by MCN. Topics included the evolutionary basis of the human brain, brain development and regeneration, epilepsy, the vestibular system which controls balance, learning and plasticity, logic, Alzheimer‘s Disease, and ethics. "Ecce homo! Menschenbild - Menschenbilder"
The first LMU Lecture Series, a cross-faculty initiative debating current interdisciplinary themes by international speakers, was held in the 2006/2007 academic year. Under the title "Ecce homo! Menschenbild - Menschenbilder" (Behold the man! Concept(s) of man), the 15 lectures presented a selection of concepts on humanity. The events were co-organized by the Munich Center for Ethics, one of MCN's Collaborative Research Centers.